Katherine Benton-Cohen is associate professor of history at Georgetown University. 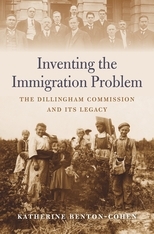 She is the author of Inventing the Immigration Problem: The Dillingham Commission and Its Legacy (Harvard, 2018), Borderline Americans: Racial Division and Labor War in the Arizona Borderlands (Harvard, 2009), and served as historical advisor to the documentary feature film Bisbee ’17. Benton-Cohen was a fellow at the Wilson Center for Scholars in 2009-2010, and currently serves as an Organization of American Historians (OAH) Distinguished Lecturer.